There was a time when one of Vinyl Connection’s favourite recreations was reading a print biography of an artist while concurrently working through their catalogue of recordings. Soundtracking a music journey, you could say. Genesis, Fleetwood Mac, Zappa – all have provided entertaining reads and enjoyable playlists. A more recent print adventure was the idea of simultaneously reading two books about essentially the same thing. For example I shuffled, chapter by chapter, between Eric Clapton’s autobiography (2007) and Ray Coleman’s 1994 ‘authorised’ biography. It was fascinating to encounter divergent versions of the same events while the double-barrelled approach provided some sort of buffer against the essential narcissism of most rock autobiographies. But I have noticed that there is less reading of music books in recent times, possibly a time issue of course, but there is another thread here. Because I am still listening to chunks of artists and swathes of a particular genre; it’s just that the catalyst has changed. Nowadays the impetus comes from the news that someone has died. Is this some macabre ritual or ghoulish voyeurism? Maybe; I’d have to ask my psychologist. But I think it is about marking. Pausing for a moment (or an hour or an album) to revisit the musical legacy of someone I have thought enough of to purchase their work. Making time to invite their creativity and vision into my lounge room for a communion of sorts. It is mysterious to consider that the breath or muscle used to make sound was triggered by electrical impulses delivered along human nerves from a pulsing brain, birthed in some distant (or not so distant) place in a different time by a living entity. Now no longer living. Typically, Daevid himself is direct, writing that he is no longer interested in invasive medical interventions and that it is time for him to make the transition. Despite being only a moderately devoted Gong-fan, I’ve taken the opportunity this morning of gathering and playing a selection of Gong-music. It seems fitting. First I played the first album, Magick Brother, all hippy folk and scattered ambition, enjoying its naivety and haphazard part-formed energy. It sounds of its time (recorded September/October 1969) and offers pointers of where Allen and partner Gilli Smyth would go. Then I played the Radio Gnome Invisible trilogy from Flying Teapot through Angel’s Egg to You. I noticed what I’ve found before: that I like the albums more as they go along; there is less silliness and more spaciness in the latter two albums. Not that I have anything against silliness, but sometimes pixie whimsy can wear a bit thin. 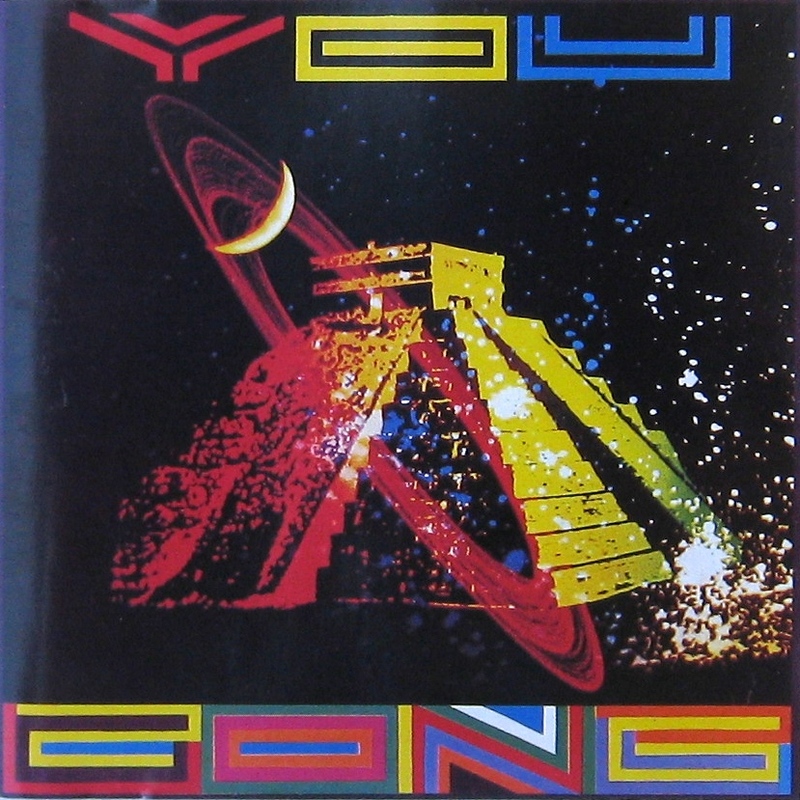 For fans of progressive music averse to pixies but into space jams, I’d probably suggest tackling Gong backwards from You. Guitarist Steve Hillage is more prominent on the final album (which was in fact Daevid Allen’s last for a considerable period). Hillage is in brilliant form on ‘Master Builder’ while Didier Malherbe enriches ‘The Isle of Everywhere’ with wonderfully atmospheric sax prior to another great Hillage guitar solo. 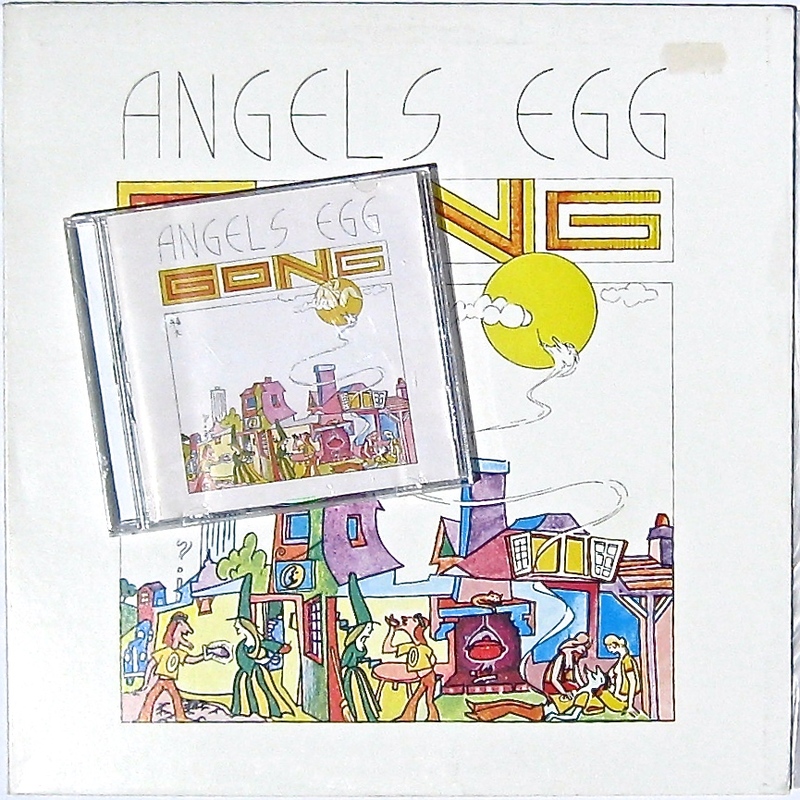 LP & CD of Gong’s 1973 album. Play spot the difference and then comment on censorship in the Arts. Many would say that the music and story-telling are most in balance on Angel’s Egg. It’s a good argument. Opener ‘Other side of the sky’ has Allen’s chanting vocals and superb Tim Blake synthesiser work while the following ‘Sold to the highest Buddha’ revels in Allen’s mischievous humour, aided and abetted by Didier Malherbe’s sax. The patented Hillage glissando guitar is introduced briefly in ‘Castle in the clouds’ before Gilli Smyth chanson’s and whispers her way through ‘Prostitute poem’, again cheekily augmented by Malherbe’s woodwinds. And so it goes, a cavalcade of beauty and weirdness through to the spirited space-jazz-rock of ‘I never glid before’ and the preposterously titled finale ‘Ooby-Scooby Doomsday or The D-Day DJ’s Got The DDT Blues’. Gong in excelsis. 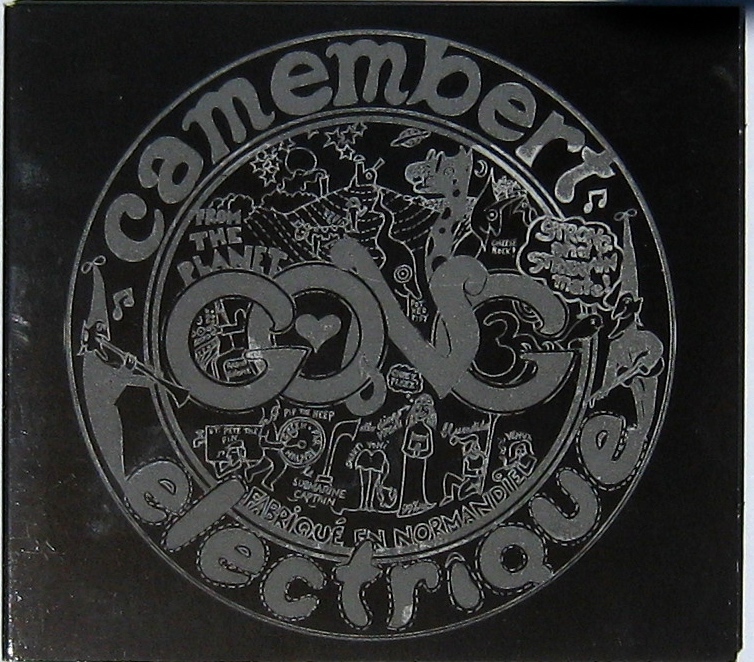 To complete the tour I played Camembert Electrique, and was delighted by the freshness and invention of the first ‘proper’ Gong album. The pothead pixie weirdness is there, as is a manic explosive energy that lights up with pop, rock, even some jazz flashes. This album stands as a wonderful tribute to Head Pixie Allen. Go gently, Daevid. Thanks for your unique vision and tireless experimentation. 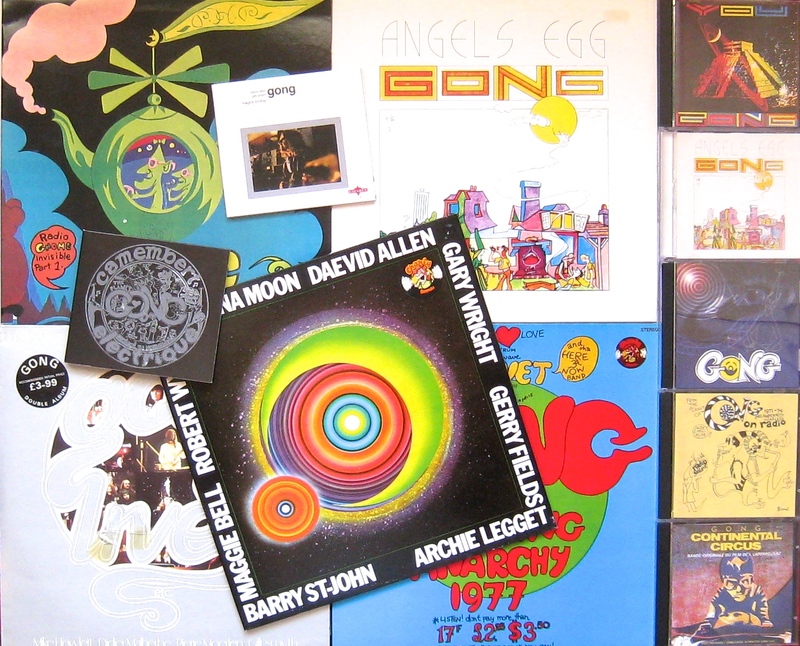 Words and music by Daevid Allen, born Melbourne, Australia, 1938, died 13th March 2015. Is that anything like The Ghost in the Machine? Or Machine Head, for that matter? drawing on your duography theme, the question of life after death, the nature of the space/time continuum and/or human wishfulness. Ah, indeed Mr D. That Arkestra is a strong spirit. Fine line between searching for and being lost in space. C’est une damn shame. I’ve always loved the idea of Gong but have been put off by the LPs of theirs I’d heard; my dad had a couple and one of my friends was massively into them. It’s that whimsical thing that put me off them, although I’ve always really rated Hillage as a player. Yep, there’s a high whimsy quotient for sure. Try You sometime; Hillage shines. PS. Do you know Mushroom (the last post)? Thought they’d be right up your musical alley. No, but I wrote them down on my list. Literally, in a notebook – I’m that old school. I’ll give Gong another go too, I may just have been too young. You have expertly preempted me! An excellent post! Thanks a lot, but please don’t be deterred. I’m definitely up for reading another take on a fascinating musician.